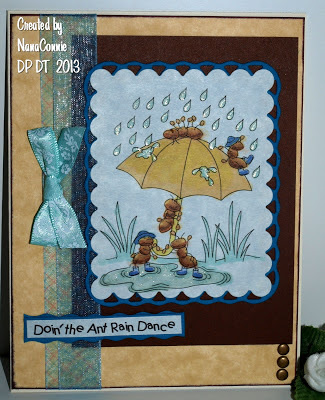 I colored the image with Copics and Promarkers, added "Fairy Dust" paint from Creative Inspirations Paints to the raindrops and puddle, then die cut it and added a die cut frame. I matted the entire image onto brown CS, leaving one edge free so I could slide the ribbon under it just slightly. I added everything to parchment CS in the same Creme Brulee shade as the umbrella. The sentiment is mine, printed with a computer font, and matted with a scrap piece from die cutting the frame. I used only the three types of embellishment: ribbon, bow, and 3 brads. Let me start by saying that I LOVE THIS CARD! lol Mostly, I'm crazy about the image -- "Daisies and Butterflies," which is from Delicious Doodles, of course, since this is my DT card for the new challenge starting today. Our theme is to "Use Lace." I'm still in a mood for spring even though the weather has already turned hot. Those of you in cooler climes, especially those getting rain, count your blessings. We're hot and dry and our fire season has started already. Maybe that inspired the colors I chose as much as the color challenge I'm entering. and the colors are from Sparkle n Sprinkle. I colored the image with Promarkers, then added two different glitters (from Sparkle n Sprinkle) to the butterfly wings. I used Fire Engine Red and Cyclamen. 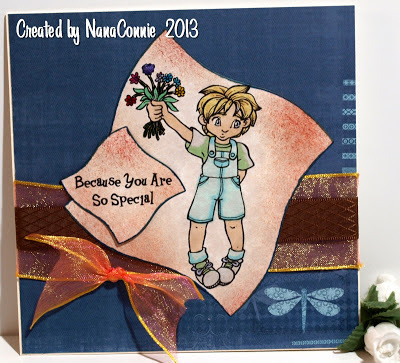 The image is die cut with an oval die from QuicKutz and inked on the edges. The lace was in my recycle stash and came from an old dress sleeve. I adhered it on top of red handmade paper, and that was adhered to a layer of white CS. The ribbon for the bow was also in my stash, and the paper flowers are from Recollections. I added the gems to the flower centers. Finally, I dug out two rhinestones for a bit more bling. It's said that in the language of roses, red ones stand for love. If that's true, then today's card is just filled with love. I was visiting favorite blogs last week and ran across this post on Crafting Vicky's blog and thereby discovered a new progressive challenge blog. The images that have to be used are from Imagine That and each challenge requires you to use the latest free digital image. Since they were already into the challenge, I had to purchase the rose digi but it's so gorgeous, who could resist. From now on, as long as I enter the challenge with each new image, I'll get the next one as a freebie. I used a sketch from Operation Write Home, one of my favorite groups. You can find out more about them by clicking on their badge on my right sidebar. I took the colors from Dynamic Duos. Coloring the image with Promarkers took some effort because I used only my lightest "red" marker. I just added more color in layers (let it dry between covering strokes) to darken the shaded places. The darker the red, the more it tends to 'bleed' over so I was very careful to darken it slowly and gently with light strokes. I also added touches of white to the rose, and covered the leaves with white after I had used a very light pastel green on them. I really didn't want any color other than the red to go with the black and white, which was the reason for the white overlay on the leaves. I want to start by wishing a Happy Mother's Day to all of you who are celebrating today, either as mothers or as daughters. A couple of days ago I shared a Gibson Girl image with you and today I've used another similar image but this time it's a digital image and it's by the sponsor of our latest challenge at 613 Avenue Create, Rick St. Dennis. This image is called 1935 Hat. Isn't she just marvelous? This week, we'd love to see you do shaped cards. Of course, our challenges are always "Anything Goes" but we always have an option, too. 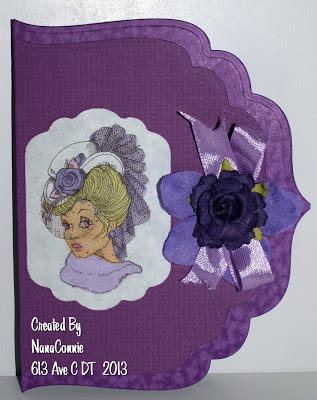 So, do a shaped card, or come play along with just the "Anything Goes" -- we want to be inspired by your creativity. I used a brand new Grand Caliber die set from Spellbinders to cut the card shape from heavy duty CS, folded it in half, and then layered on another die cut of the same shape but one size smaller. The smaller shape is embossed with a "Linen" embossing folder, and both layers are embossed around the fancy edge. I bought this die set, the first for my Grand Caliber, specifically because I thought it would make really great shaped cards. I was right, wasn't I? 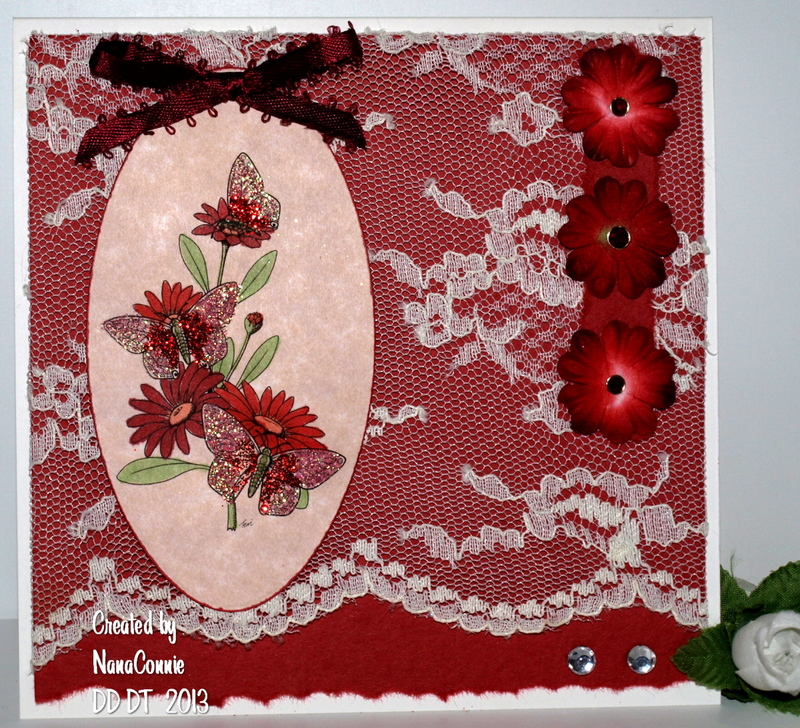 Rather different from the usual round or oval or scalloped-something card, wouldn't you say? I colored the image with Promarkers, then die cut it, and inked the edges before adhering it to the card front. The flower embellishment in made by layering together silk petals, silk ribbon, and then a large, mulberry paper rose. The ribbon was recycled from an old gift bag on which it served as the handle. I needed an anniversary card for one of my regular card customers and this image, drawn by Anne Fenton, came from the Creative Freebie Challenge at Outlawz just in time. She told me brown and yellow were her wedding colors. I used the sketch from Creative Inspiration Paint FB. The image is colored with Promarkers and I added 'Fairy Dust' Creative Inspirations Paints to her "gown" for some shimmer. I die cut the image, inked the edges, and stippled it with "Old Tea" distress ink. I added pearls to her necklace and to the middle of his bow tie. The brown die cut you see is actually the negative space from a die cut, left in the yellow CS after cutting. 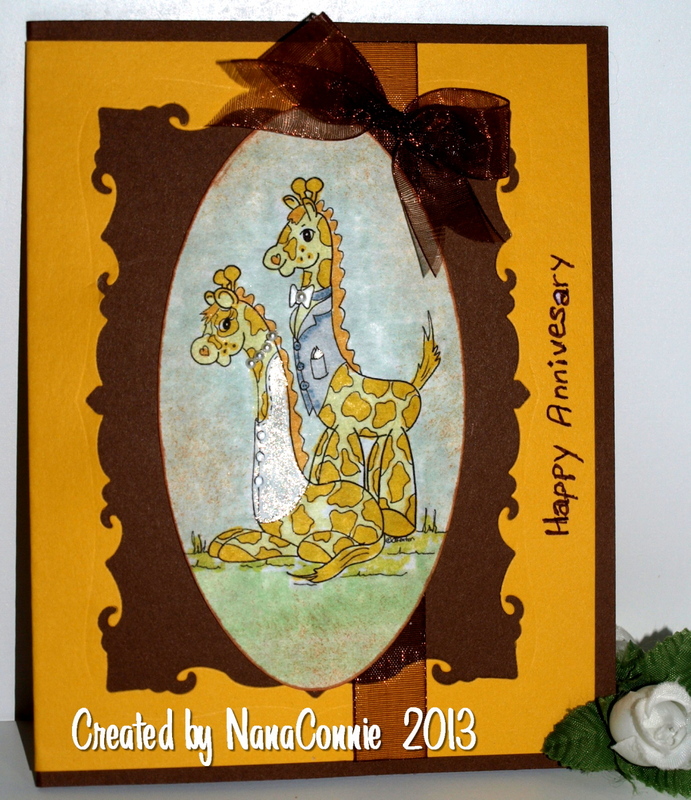 I added the sheer, brown ribbon and then I adhered the yellow piece to the brown card base. 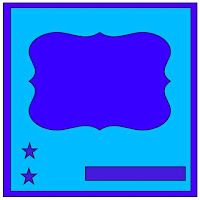 After that, I layered the oval image over the top so that it looks like the brown is a framing mat around the image. The yellow CS wraps around the back of the card also. I tied a bow from that same sheer ribbon and attached it to the top of the oval. The card front looks rather fancy and intricate but it's really pretty CAS. 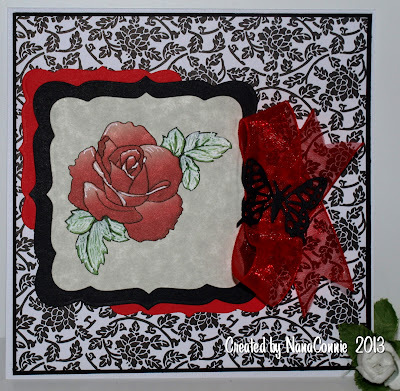 and I chose the colors from the challenge at Scrappiness Designs. I tried adding the two angled pieces to the background but just couldn't make them work. I don't know if it was the particular paper I selected or what, but they were a distraction from the image, so I took them out. Apologies to the sketch designer. The background paper was also in my stash and I don't remember the manufacturer. I distressed it slightly by sanding it very lightly with a super fine grit sander. Country View Crafts -- How does your garden grow?